Pleasant Valley, IA - It's not how old the dog in the fight is, it's how much fight is in the old dog. Ronnie Weedon, a 70 year old racer from Pleasant Valley, Iowa has lots of fight left in his 54th consecutive year of stock car racing. Although most other men he has battled retired from racing long ago, Weedon hangs on just because he enjoys the racing and the people. "I've made good friends, not just fans, but friends," says Weedon. And friends are hard to leave. Weedon began racing with a bunch of youngsters back in 1948, after they had been at Mahoney's Variety Park in Davenport, Iowa to check out the quarter mile track and see what all the excitement was about. Weedon and his 2 cousins, Ernie and Ray Speth, thought it looked like so much fun, they'd give it a try. The boys took their street car to the track and Ray drove the first couple of weeks. "I didn't like the way he was doing it" recalls Weedon. "My dad told ma, If I was so damned smart, maybe I should do the driving myself." The only problem was that, Weedon was not old enough. Mahoney's had a rule that drivers had to be 21. Weedon's father knew the promoter, Burt Mahoney, and after some pleading and arm twisting, the young Weedon was granted permission to drive by lying about his age. He was finally where he wanted to be-behind the wheel but he was not an immediate success. "I was upside - down the first two or three weeks," Weedon confesses. The boys started with a '35 Ford coupe that also served as their street car. All they had to do was roll down the windows, remove or tape over the headlights, install a seat belt, and don a helmet. Seatbelts and helmets are Army surplus. "In those early days, we'd buy an old coupe for $15-20 dollars. When they got wrecked, we'd just push them off in the holler back of the house. It was cheaper than trying to repair them," says Weedon. "That holler is now a park," he adds. "In the 50's the cars got fancy. We started using roll bars and chopped the fenders. For a roll bar, we used a swing set frame that we chained to the door posts. Later, we got fancier and welded drive shafts together for roll bars. Four corner roll bars did not come around until the 60's. "We had the novelty of the neighborhood," recalls Weedon. My brother and my uncle started helping me, then all the neighborhood kids started ." Weedon still has an old record book from the Mahoney days. Lap times on the quarter mile track were 21 to 23 seconds, speeds now considered slow for half mile tracks. Rolling cars over and driving them off was pretty common back then. Weedon entered the service back in 1952 , but duty did not stop him from racing. He was able to race before he went off to basic training, than made it home again before shipping off to Germany. He made it back home the following season long enough to squeeze in a few races. In 1954 he was discharged. After returning home, he bought a racecar with a number 00 on the side. Weedon, who had raced number 15 before, simply left the number 00 on the side, and it has been with him ever since. Weedon raced Fords until the 1970's. He ran a 292 C.I.D. powered 1955 Ford, then went to the big 427's. In 1971 he bought a brand new mustang body in a crate, and powered it with a 429 Hemi engine. In 1972 he switched to a chevy, using a chassis kit from Bobby Allison. Unfortunately, the car did not work well. 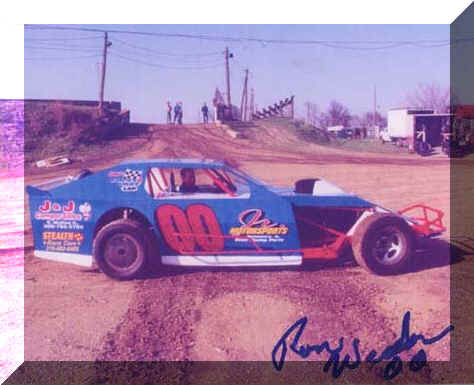 After a season of thrashing with it, Weedon switched to a 73 camaro with a Boyce chassis which he nicknamed "old Blue" Old Blue was true, winning 94 heat races, 43 semi-features and 86 feature races over 6 years. Incredibly, Weedon still has it today. Fortunately, he doesn't race it. One key for Weedon to remain in racing so long is his temperament. "No one lasts in racing this long if he is not even tempered," says Don Bohlander, one of Weedons former competitors. "After an incident, he'd forgot about it by the next week." "I've never been in a fight or in trouble, and I've raced at some rough tracks", says Weedon. I did get black flagged once. Jim Strube and I were best friends, but he was a rough driver. One Saturday night in Peoria Illinois, I got into it with him and got black-flagged because I go the best of him." "I raced against Ronnie a lot of times," recalls Jim Gerber. "We used to go at it pretty good at East Moline Speedway. He's a good guy. You never worried about Ronnie, unless you had one coming. ": He liked to race the semi, because it paid more than winning a heat. One time we were going at it for third, when Ronnie started holding back. The last lap, I hit the brakes and Ronnie shot by. He qualified thru the heat and didn't get to run the semi." "Ronnie's quite a guy," Ernie Speth says. "We both started racing at the same time at old Mahoney. He was a hard driver. Some people thought he was maybe aggressive, but when you start in the back, you have to pass two at a time. "When a guy wins the first few races, the fans cheer for you. But you get some boo's after a lot of wins. "Weedon improved over the years, from a kid rolling cars, to a serious competitive racer. He became the man to beat in the 70's and 80's-the local hot dog. Although he doesn't win as often now, he is still competitive and has the desire and ability to win.